Today Nintendo of Europe (and Australia) added new classic games to the popular Wii Shop Channel. The games went live at midnight CET. Wii owners with a high-speed Internet connection can redeem Wii Points to download the games. Wii Points can be purchased in the Wii Shop Channel or at stores like Amazon UK (Card). The second week of the Hanabi Festival 2 brings more Japanese and American exclusives to the Wii Shop Channel, this this time courtesy of SNK Playmore, Sega, Hudson Soft, and Naxat Soft. 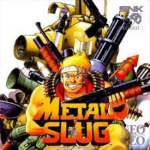 Metal Slug (priced 900 Wii Points = €9 / £6.75 / AU$13.50): Take up the challenge of Metal Slug. SNK’s classic side-scrolling military action game from 1996. You control Marco (in one player mode) and Tarma ((in two player mode), members of the special ops force Team Peregrine Falcom (Team PF). Team PF are the Army’s last hope in their quest to overthrow the rogue General Morden and recapture the stolen weapon Metal Slug. — Move through the levels by jumping and using the wide range of weaponry at your disposal, including heavy machine guns, shotguns, rocket launchers and flamethrowers as well as the Metal Slug itself. Use them well as you take on waves of enemies in one- or two-player mode. The tutorial is available in English and Portuguese. Game supports Wii Component AV cable Interface Mode. Puyo Puyo 2: Tsuu (priced 900 Wii Points = €9 / £6.75 / AU$13.50): The object of this head-to-head puzzle game from 1994 is to clear your grid of falling patterns called puyos by forming chains of four or more same-colored puyos in a straight line or one of several geometric patterns. What makes this a challenging two-player contest is the fact that when you clear a chain of puyos from your grid, it drops a random piece of filler onto your opponent’s grid. The more puyos you clear, the more you fill your opponent’s grid, and if you can clutter up his grid enough to fill it to the top, you’ve won the game. An intriguing backstory makes this an amusing experience for one or two players. In-game text will include some Japanese. Game supports Wii Component AV cable Interface Mode. Cho Aniki (priced 900 Wii Points = €9 / £6.75 / AU$13.50): The odd world portrayed in this single player shooter made it quite the conversation piece in its day (1992). Players control either Idaten or Benten, celestial warriors out to bring an end to the tyrannical rule of Emperor Builder, who holds muscular prowess to be the supreme virtue of the universe. Aided by able-bodied muscleheads Adon and Samson, they must battle to defeat the emperor’s army across live stages. Use your weapons to attack the Builder forces. Or cut through them with a man’s ultimate weapon, the Man Beam! Power up your character and options with Protein from defeated enemies to have them bulk up with a yell and take their macho battle to the next level! In-game text will include some Japanese. Break In (priced 700 Wii Points = €7 / £5.25 / AU$10.50): Gather up to four players for an authentic game of pool right in your own home. Choose from six billiards games such as 9-ball, Rotation and Carom (a game played without pockets). Use Simulation mode to calculate the perfect shot or select Action mode and check out what went wrong with your missed shots. With so much to choose from Break In gives all players, from beginners to experts, everything they need to enjoy a great game of pool. And it doesn’t stop there, select Technique to practice your angles or even go for a trick shot. Get some help from the CPU and hone your skills. With 1989’s Break In you’ll be a pro in no time. In-game text will include some Japanese.